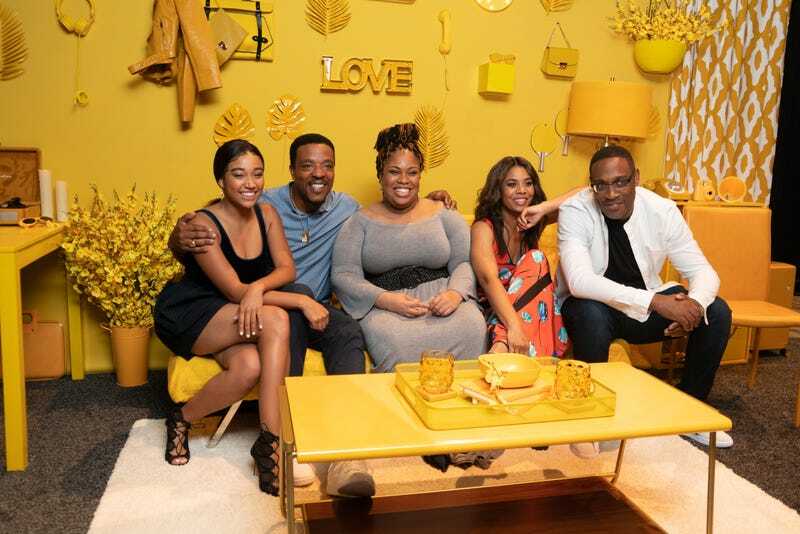 (L to R) Amandla Stenberg, Russell Hornsby, Angie Thomas, Regina Hall, George Tillman Jr. The Hate U Give is a New York Times best-selling young adult novel by Angie Thomas that chronicles the life of Starr Carter, a 16-year-old who is from a poor, black neighborhood, but attends a fancy private school in the ‘burbs. One sad, fateful night, Starr’s best friend Khalil is shot and killed by a police officer. He was unarmed. And consequently, the image that was painted of Khalil was one of a thug or a criminal and it’s just not true. This story is one that’s all too familiar these days. In fact, Thomas was inspired by the shooting of Oscar Grant, an unarmed black man who was shot and killed by BART Officer, Johannes Mehserle in Oakland, Calif. on New Years Day in 2009. This best-seller, The Hate U Give is now a feature film, starring Regina Hall (Girls Trip), Issa Rae (Insecure), Amandla Stenberg (Everything, Everything), Russell Hornsby (Fences) and more, and is directed by the legendary, George Tillman Jr. (The Longest Ride, Men of Honor, Soul Food). That is why this book is a best-seller and has become a movie because it resonates. The story is one we’re all weary of, but need some type of resolution for. Art has always had a way of helping people to understand, process and mobilize around issues that effect marginalized groups. Angie Thomas hopes that her art has that same effect. Thomas is hoping that between her book and this film that she’s planting a seed for the next generation. “I always think about these kids I write for and the kid that picks up my book today can be a politician with a Twitter account 20 years from now. I want to make sure that I plant a seed in them so when I’m in a retirement home, I’m not like, ‘Oh damn!’” Thomas laughed. One of Thomas’ biggest goals is for people to be just as upset about police brutality as they are about books about police brutality. Currently, Thomas’ book is bring protested by police officers in South Carolina who believe that her book is anti-police curriculum. While many black people grow weary having to be the ones to educate the majority on racism and that we’re human just like them, this book, film, cast and crew all take on the job of educator, willingly, so that the people who don’t seem to understand why screaming, “Black Lives Matter” is only begging the world for humanity, not elevating black lives over any others.